PLUM, MYROBALAN (Prunus cerasifera) (Cherry Plum). Hedging Plants, Trees, Shrubs and Conifers. 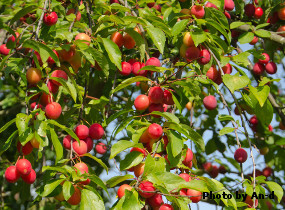 Masses of pure white flowers smother the branches in early March before the leaves appear and these are followed in autumn by tasty red or yellow, spherical cherry-plums on mature plants. It will form a dense deciduous hedge and its thorny twigs will make it an effective barrier. HEDGE Trim after flowering. For hedges 4-6ft (120-180cm). Plant 2ft (60cm) apart. TREE 20ft x 20ft (6m x 6m) in 20 years, ultimate height 25ft (7.6m).